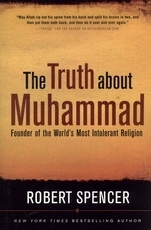 "In 'The Truth About Muhammad', Islam expert Robert Spencer offers an honest and telling portrait of the founder of Islam unbounded by fear and political correctness, unflinching, and willing to face the hard facts about Muhammad's life that continue to affect our world today. Spencer details Muhammad's development from a preacher of hellfire and damnation into a political and military leader who expanded his rule by force of arms, promising his warriors luridly physical delights in Paradise if they were killed in his cause. He explains how Qur'an's teaching on warfare against unbelievers developed - with constant war to establish the hegemony of Islamic law as the last stage."